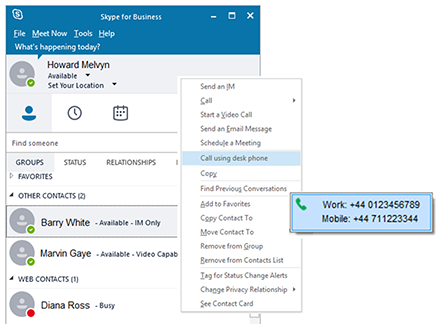 When Go Integrator is installed it will modify the Skype for Business menu to include the option "Call using desk phone". When clicked, this option will interrogate the Skype for Business Contact Card (last option in Skype for Business) and display the numbers held in it. Click one of the numbers to make your handset go off hook and dial the number.